Jason of What's Your Shine, gave me the opportunity to experience his indie brand. I don't use the word 'experience' lightly. 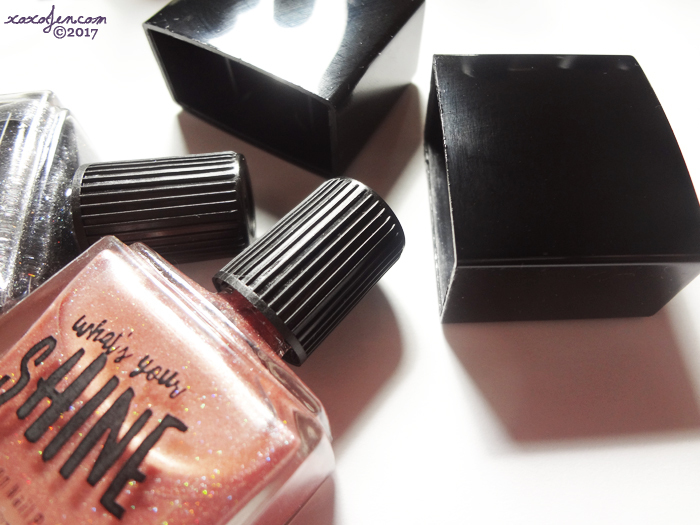 The brand is a complete package from first contact to wearing Whats Your Shine polish on your nails. Jason exhibits his passion for his brand and his customers with the great amount of care and detail to packaging and product. In my review package he included a personal thank you letter, product detail sheets, his 'about us' story, and insight to how he creates. The products arrived displayed on a crisp white foam board backing covered in a designer paper, both custom cut to fit the products and then professionally shrink wrapped. If you look closely around the edges of the product in the below photo, you can see the plastic shrink wrap. The bottles are also secured to the display board with easy to remove glue, and a nail file which prevents shifting and clanking during shipment. This is the first time I've received such a nicely packed box from an indie brand. It definitely has a high end boutique or salon feel to it. It doesn't stop there though, the overcap on the polish can be removed to reveal a grippy cap for easier polishing, and the brand label is bold and easy to read. The square bottles are quite classy too. 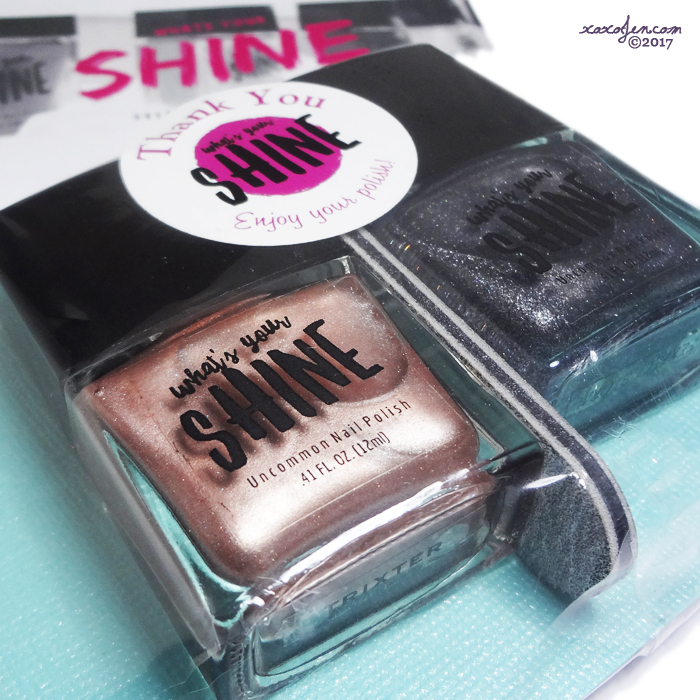 Both of the polishes below are part of the eight piece Shine Language collection. 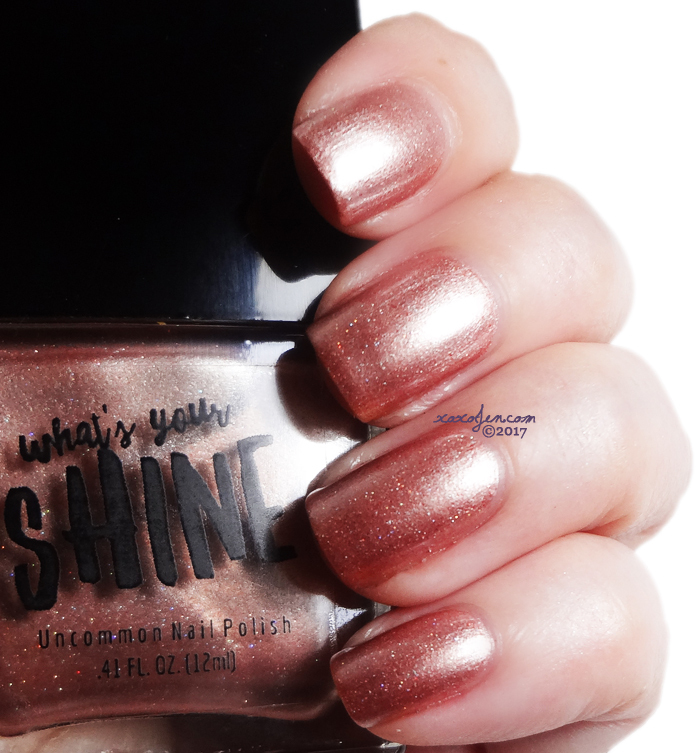 They are available now at the What's Your Shine store along with many other beautiful polishes to choose from. 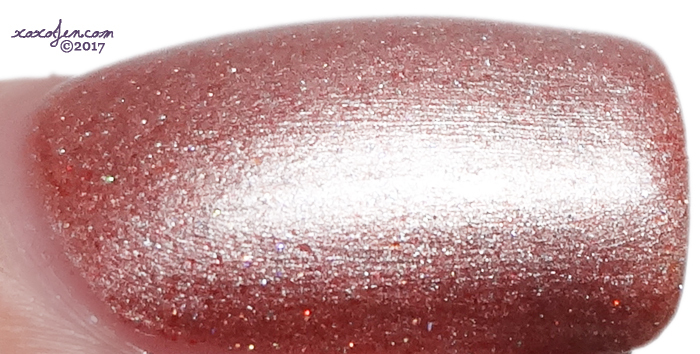 Trixter - This one keeps you guessing, you'll never see the same color twice in this shimmering iridescent Dark Pink polish. Definitely a shifty booger! On me, it looks peachy most of the time and then there's these hidden flecks the shade of pumpkin that you can see in the macro but not apparent on the nail. The holo flecks are subtle and appropriate for most business dress codes. The polish color would also be an amazing compliment to a Henna style tattoo or stamping, I'm sure! I wore two coats with topcoat, formula was excellent and I love that the overcap comes off to make polishing a breeze. 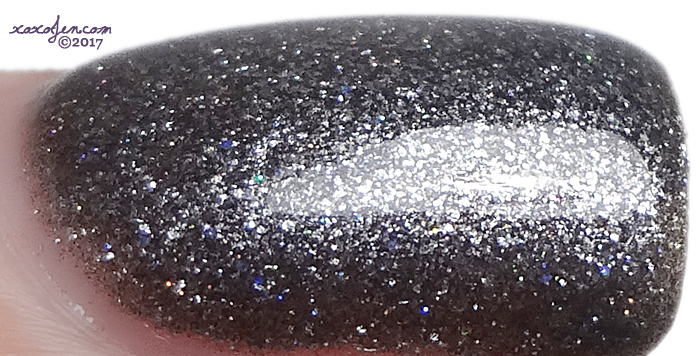 Perfect Storm - Iridescent Dark Gray Polish with a Holographic Sparkling Rainbow effect, that changes in every light. For a dark shade of polish this one sparkles like fireworks! It's so reflective and beautiful that I ended up wearing it longer than most polishes I review. Two coats and topcoat were worn and again the formula was fantastic and I have to mention that cap again, I love it. I enjoyed reviewing for Jason from start to finish and have confidence that his brand will do well. Why not give his brand a try! Visit What's Your Shine's online store. Both of them look nice. I really like the look of Trixster too.